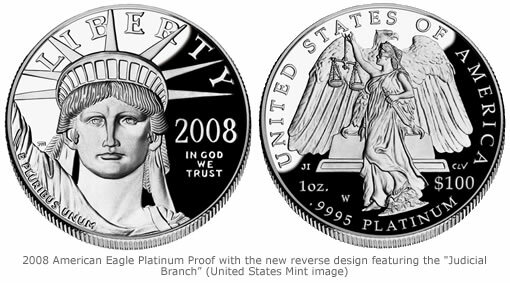 Today the United States Mint made their official announcement for the release of 2008 American Eagle Platinum Proof coins. This year’s coins mark the last"Judicial Branch" design within the three-year platinum coin series entitled “The Foundations of American Democracy.” Starting in 2006, each year celebrated one of the three branches of government. 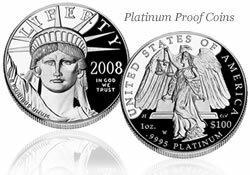 Along with pricing and design descriptions, which has already been discussed in last week’s CoinNews article entitled "2008 American Eagle Platinum Proof Coins and Pricing," the Mint also listed the mintage and product limits for the one-ounce, one-half ounce, one-quarter ounce, one-tenth ounce and four-coin platinum set. 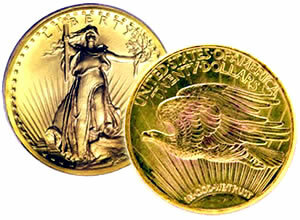 The United States Mint announced on Friday that Secretary of the Treasury Henry Paulson has authorized the issuance of a 2009 version of the 1907 ultra-high relief Augustus Saint-Gaudens $20 Double Eagle coin. The 1907 Augustus Saint-Gaudens $20 Double Eagle is considered by many to be one of the most beautiful gold coins made in the history of U.S. coinage. 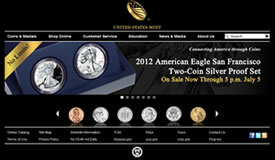 The United States Mint has set the release date and prices for the 2008 series of American Eagle Platinum Proof coins. The collector proof coins are currently scheduled to go on sale Monday, May 5, 2008. The limited mintage coins will be available in four sizes with the following weights: One-ounce, one-half ounce, one-quarter ounce, one-tenth ounce. There is also a four-coin set containing one coin in each denomination. The one ounce proof coin is priced at $2,299.95. 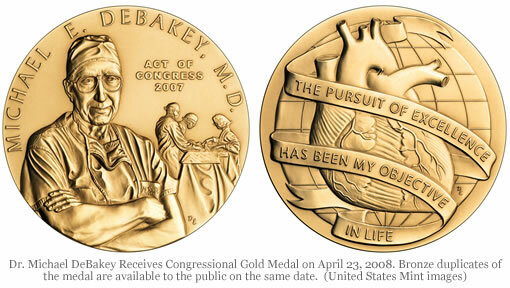 President Bush honors Dr. Michael E. DeBakey and commemorates his many life accomplishments and contributions to the nation with the Congressional Gold Medal at the United States Capitol Rotunda on April 23, 2008. The Congressional Gold Medal is the highest civilian award which may be bestowed by the United States Congress. Each Congressional Gold Medal is individually designed to reflect the accomplishments of the recipient. Public law also authorizes the United States Mint to produce and sell bronze reproductions of the medal.